UPDATE Tuesday 5th May, 2015: Unfortunately Mr Greg Browne has had to withdraw a judge of the Open Show due to a serious medical condition. Mr Matthew Morse has kindly agreed to judge in Mr Browne’s absence this Saturday, 5th May 2015. 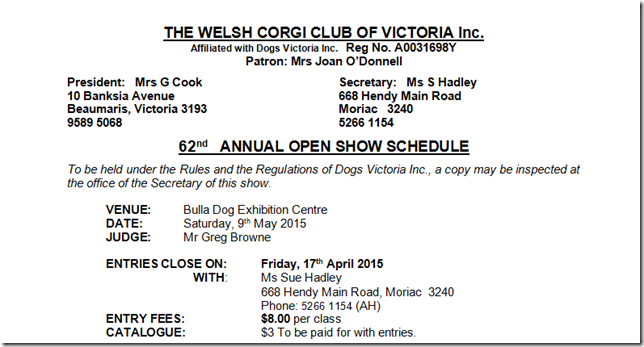 The Welsh Corgi Club of Victoria’s 2015 Open Show has moved back to May. The 62nd Annual Open Show will be held on Saturday, 9th May 2015; and will be held in conjunction with the 2015 Annual General Meeting. The AGM is scheduled to start at 11am, and judging of the Open Show will start at 12noon with Cardigan Dogs. As the German Shepherd National is being held at KCC Park on the weekend of the 9th-10th May, it was decide that for this year only the Open Show will be held at the Bulla Dog Exhibition Centre. This year’s judge is Mr Greg Browne, and entries close with Ms Sue Hadley on Friday, 17th April 2015. This entry was posted in Blog, Events and tagged Open Show by WCCVAdmin. Bookmark the permalink.